Republic Pictures was the M-G-M of B-movie studios. They were mainly known for their serials and B-Westerns and rarely ventured into A-feature territory. However, the company's product did sometime compete with the big boys on the other side of the Hollywood Hills. Back in the 1930s through early ‘40s they had Gene Autry, the singing cowboy who not only topped the list of B-Western stars but also ranked in Hollywood's more important Top Ten list of box office attractions. And, after the success of John Ford's Stagecoach (1939), a United Artist release, Republic contractee John Wayne joined the ranks of Hollywood's top stars. Republic shrewdly loaned him out to major studios while simultaneously featuring him in their biggest productions, peaking with Ford's The Quiet Man in 1952. Mostly, though, Republic shied away from genres with which they were unfamiliar. They almost never made horror and science fiction films (beyond the sci-fi fantasy of some of their serials), and they generally steered cleared of noir and mysteries, screwball comedies, and musicals. Well, sort of. Studio head Herbert J. Yates, married at the time, infamously fashioned his mistress, Czech figure skater Vera Hruba Ralston, into the would-be, Sonja Henie-like star of a series of expensive flops, though only one of these, Lake Placid Serenade (1944), was a full-blown musical. And, of course, Republic's bread and butter were its singing cowboy movies, first with Autry and later, when Autry went to fight in the war, genial Roy Rogers. Brazil (also 1944) was another effort by Republic to break into the A-list musicals field. Modeled after Fox's Technicolor extravaganzas with Betty Grable and Carmen Miranda, Brazil was in black-and-white but still quite elaborate by Republic's modest standards. It hedges its bets a little in that it still manages to incorporate a ranch (a coffee-producing fazenda) with cowhands and even squeezes in an awkward guest appearance by Roy Rogers, "King of the Cowboys." In sunny vacation haven Rio de Janeiro, writer Nicky Henderson (Virginia Bruce) is preparing a travel book on Brazil. Embassy agent Rod Walker (Robert Livingston, of Republic's "Three Mesquiteers" series) hopes to wine and dine her into submission, but she's drawn to cherry Miguel "Mike" Soares (Tito Guízar), who poses as a poor, uneducated guide but in fact is a famous and wealthy songwriter. Mike's fussy manager, Everett St. John Everett (Edward Everett Horton), is worried about the imminent arrival of Broadway show producer Edward Graham (Richard Lane), who's paid Mike for a tune that's Mike's yet to deliver, or even start composing. Mike, however, is more interested in wooing Nicky, even posing as his own twin brother in an elaborate plot to simultaneously humiliate and marry her. Brazil isn't particularly good by any measure, but it's certainly fascinating as an artifact of its time and studio. Partly, the picture reflects Hollywood's cooperation in FDR's Good Neighbor Policy, an aggressive pro-Latin American relations program that famously resulted in movies like The Gang's All Here (1943), which shares plot and casting elements with Brazil; Orson Welles's ill-fated It's All True (1942); and Walt Disney's Saludos Amigos (1942) and The Three Caballeros (1944). Brazil isn't anywhere close to being in the same class with any of those pictures, but it does offer pleasing sounds and sights of Latin American culture, oddly little of it Brazilian. Co-star Guízar was Mexican but manages a Portuguese accent and dialogue well enough only native Brazilians are likely to notice he's an imposter. 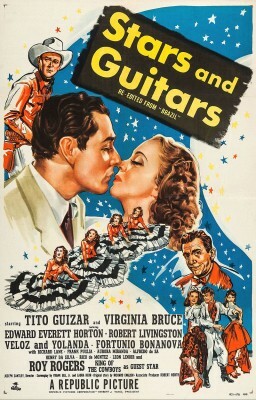 Opera-trained, Guízar popularized Mexican song and was a featured performer in A-list movies, with bigger parts in B-movies like Blondie Goes Latin (1941). He died in 1999. Veloz and Yolanda were married ballroom dancers (only Frank Veloz was Latin American; Yolanda Casazza's family was Italian) that helped popularize Latin dance, while Aurora Miranda, younger sister of Carmen and who danced with Donald Duck in Three Caballeros, does a show-stealing "specialty." None of the principals set foot in Brazil; what footage there is of Brazil is all second-unit footage like all of Elvis Presley's later travelogue musicals not set in America. The footage itself is interesting for simply capturing Rio and its Carnaval in the ‘40s, but on a Republic Pictures budget the stars never get further than what might have been a real coffee plantation somewhere in the High Desert north of Los Angeles. If nothing else, Hollywood insiders gave Brazil an "E" for effort, tossing it a few bones in the form of three Academy Award nominations, for Best Score, Sound, and Song, losing all three. In standard (1.37:1) size and black-and-white, Brazil is yet another Paramount-licensed, Olive Films release that looks great; no complaints here. The 1.0 mono audio is likewise reasonably robust and, for a change, optional English subtitles are offered. Region "A" and no Extra Features. Not good, exactly, but an interesting artifact with some fine Latin music and performances by guest artists. For the curious, Brazil is Recommended.